The Art of Broken Age came out a few months ago, and celebrates the gorgeous art of one of Kickstarter’s most famous games. I really enjoyed the first half of the game, but found the second half disappointing in terms puzzles. That being said, the art was consistently amazing, so I was looking forward to reading the book. TAoBA begins with a short forward by Tim Schafer, the creative director on Broken Age. He talks about the evolution of art and artists in terms of video game design, which is interesting, especially when thinking about the difference between 2D and 3D design. It also includes a sketch by Tim of the title screen/cover of the book, which is adorable. The book is broken up into ten sections: the aforementioned forward, early concepts, Vella and Shay, The Bassinostra, Sugar Bunting, Meriloft, Shellmound, Loruna, end credits artwork, and backer portraits. The early concepts section covers creating characters, building worlds, monster creation, and the overall initial brainstorming of the game. They talk about what makes a good character design, specifically focusing on personality, readability, and expressivity. There are a lot of drawings in this section of characters, environments, and objects that never made it into the game, and it was cool to see such early brainstorming. It also does a good job of showcasing each artist’s work individually. The rest of the sections focus exactly on what you expect them to. I loved seeing the evolution of Vella and Shay’s design, and knowing what directives the artists were given to explore. I especially enjoyed the section on the Bassinostra – all the spaceship designs are so cool, and the hexipals were some of my favorite characters. It’s really nice to see the backgrounds of the game without characters throughout the book, so you can appreciate them as art more. The Sugar Bunting section reveals that Vella’s story originally had a backstabbing prince and a huge castle, which were cut for time. It’s also really interesting to see where backers had the most influence on the game. I appreciated being able to see the end credits art again! I really recommend this book, especially if you played Broken Age, but also if you’re just interested in the process of creating a whole new game world from scratch. It’s funny, informative, and shows off the art wonderfully. There’s also a good balance of text and art throughout; it’s an art book, so there’s obviously a lot of illustration, but the text always gives you enough context and introduction for the art. I hope that they use some of the abandoned ideas for another game! There’s so much cool stuff, like a dung beetle light house and a village full of kite people. If you haven’t played the game but plan to, there are a lot of spoilers here, so take that into consideration before diving in. 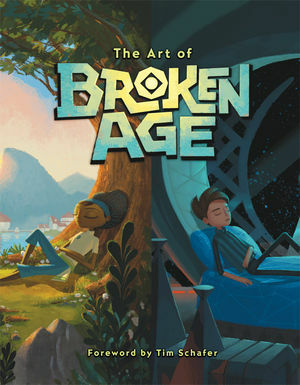 You can get The Art of Broken Age from Dark Horse Comics, Amazon, or your favorite book retailer. Coverage of Broken Age on Nerdy but Flirty can be found here.